Kathy, for instance. 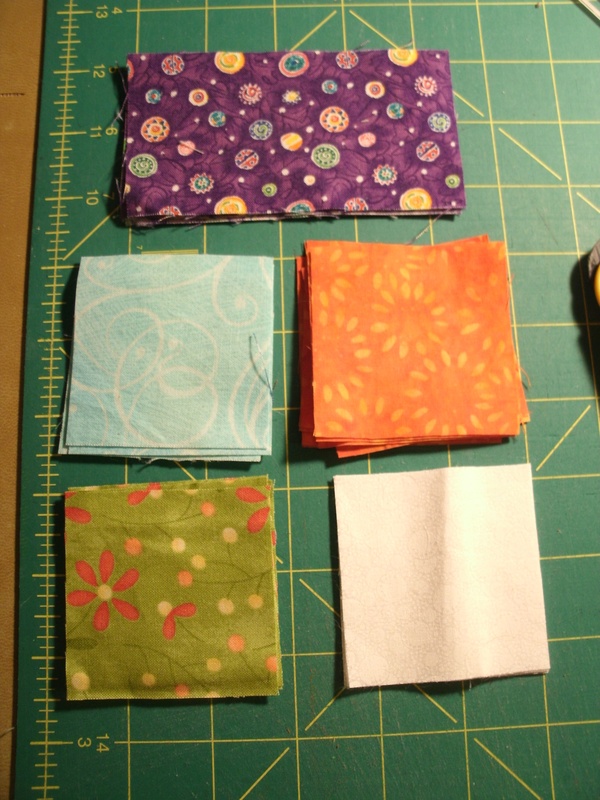 My BQB (Best Quilting Buddy) I blame my fabric stash that has grown so large my sewing room can’t hold it on Kathy. She drags me to the local quilt shop on Fat Quarter Fridays. Yes she does…she MAKES me go in there! If there’s a bolt of fabric I just absolutely love, she will not let me get just the quarter-yard that would make me perfectly happy. “Three yards” is her rule, “because you might want to use it for borders.” It’s her fault. When I stand at the Pearly Gates and St. Peter quizzes me about the year I gave up buying fabric for Lent, I will point at Charlotte. I only went into that shop for one spool of white thread. I had it in my hand and was headed for the checkout, and there she was with a basketful of bolts “all at 40% off!” I will admit I yielded to temptation, but the truth is, I went on an absolute bender. Then there’s Annette. If I mention a class anywhere within a 2-days drive, she buys the gas, I drive and we’re there. She usually finishes the projects, but I can’t hold that against her. I blame my quilty friends for my closet full of unfinished projects. Yes, Mom, if all of my friends begin a new block-of-the-month or mystery quilt or guild challenge, I must jump off of that “cliff”, too. So here I stand, surrounded by UFO’s and hoping two of my new online quilting buddies (OQB’s) will help me get my quilting life under control. “Aunt Marti” is Marti Dyer-Allison. 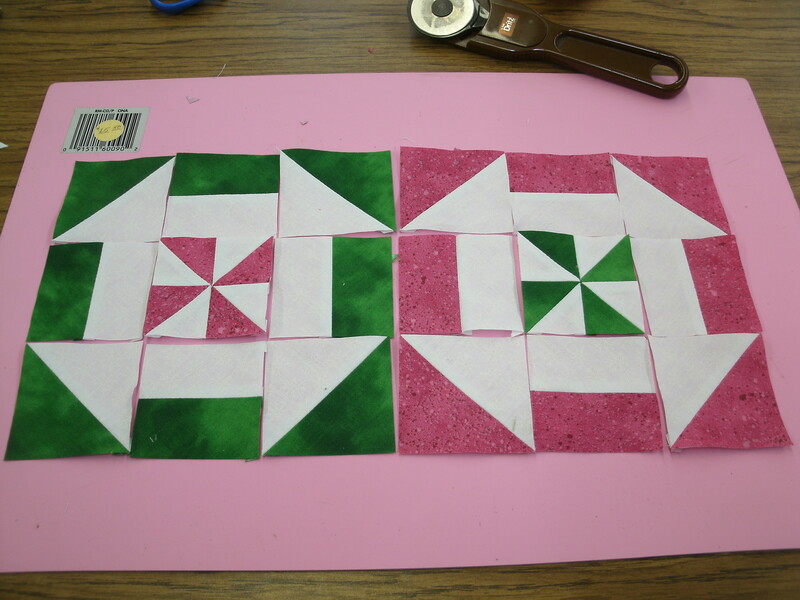 We “met” as members of Quiltmaker Magazine’s 2013 Scrap Squad. 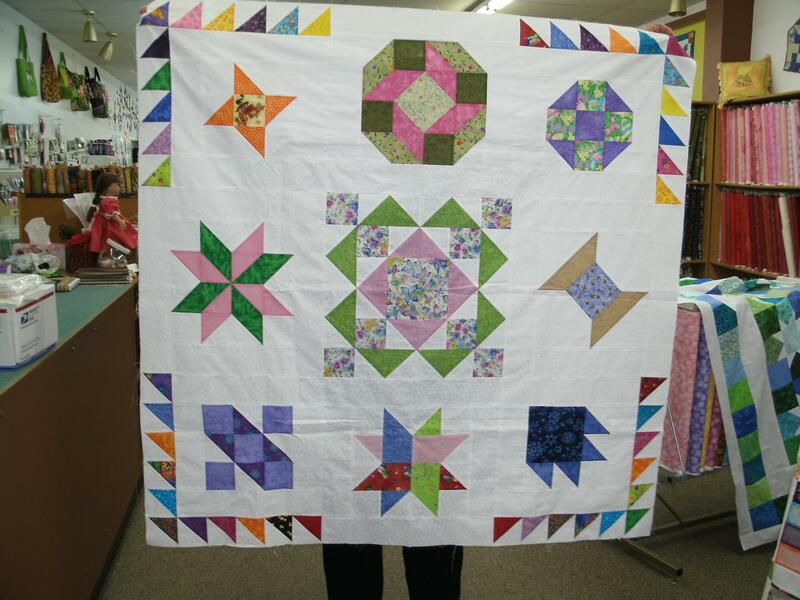 Marti produces 52 quilts a year. That’s right, one a week. 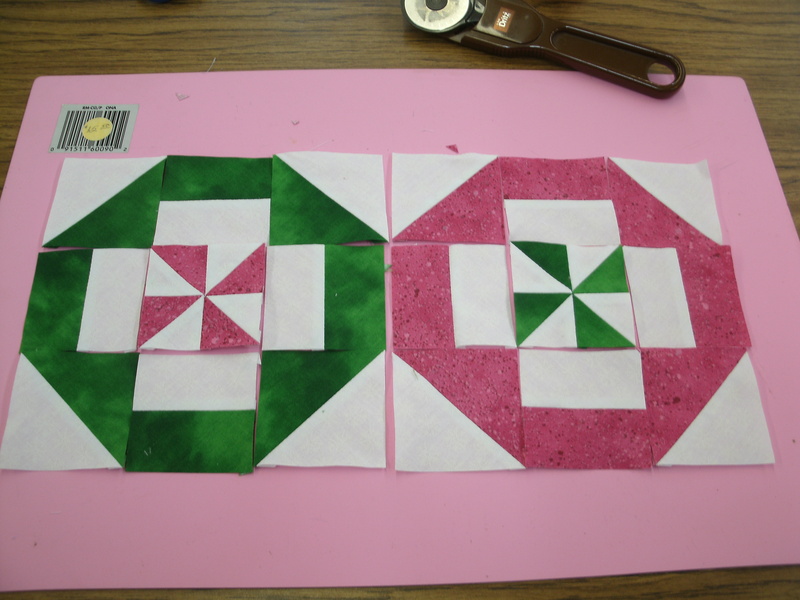 Not quilt tops, either…finished quilts. I don’t know how anyone who keeps that pace could possibly have unfinished projects laying around, but it appears she does, so she’s hosting a year-long project to complete a dozen UFO’s in 2014. One each month. 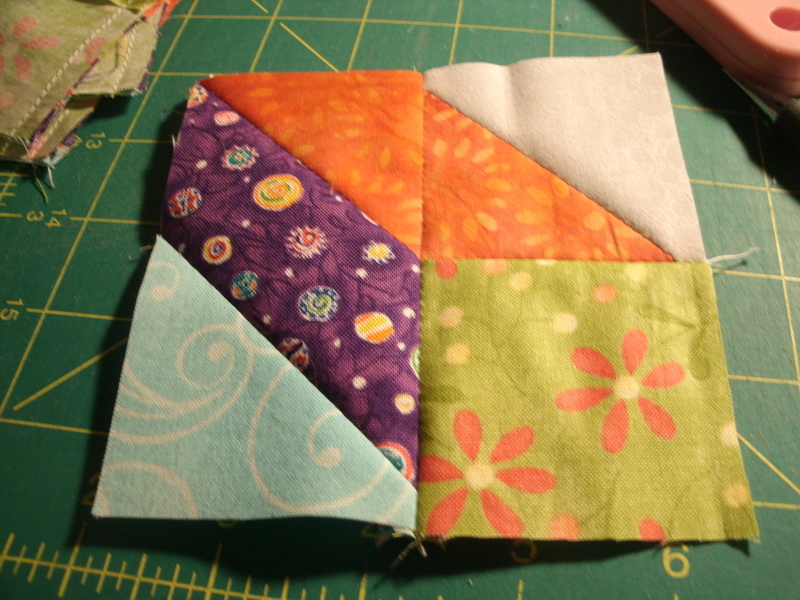 I wasn’t going to sign on, but honestly, I have at least a half-dozen quilts that just need binding. I think I can do this! Click HERE if you’d to read Marti’s blog and learn more. Then there’s Beth Helfter of EvaPaige Quilt Designs, one of my fellow Quiltwoman.com designers. It’s probably a good thing that she and I live at almost opposite ends of the country, because if we hung out in person, we might well end up in custody somewhere. She’s that much fun. She’s also a member of the 2014 Quiltmaker Scrap Squad. During the month of February, Beth hosts “Drop and Give Me Twenty”. By joining, you commit to spending 20 minutes of quality time with your sewing machine each and every day for the month. Again, I wasn’t going to jump off of this particular cliff, but then I looked at the stack of projects on my “to do” list, which is more like a must-be-done-we’re-on-a-deadline list. If I start them this week, they will technically be UFO’s on February 1st. 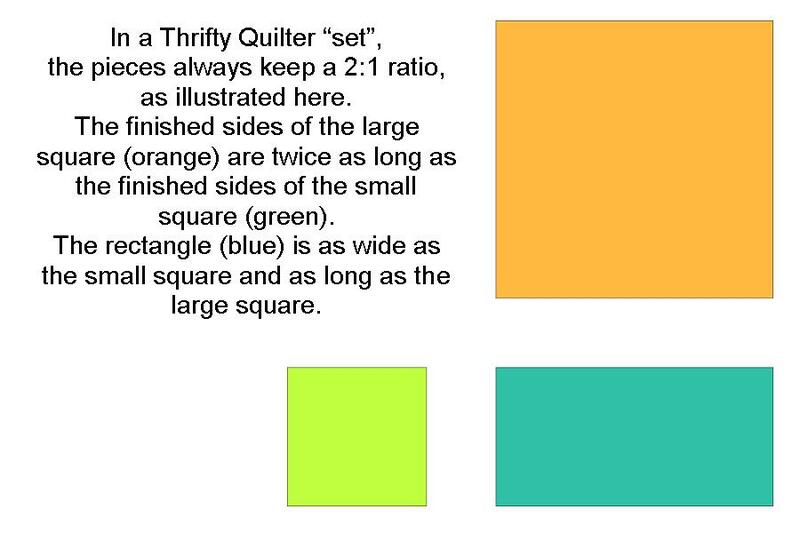 Another good reason to join DAGMT – She’s awarding prizes, including a copy of The Thrifty Quilter, written by me. Curiosity is a valuable trait for designers. I came across this YouTube video from Missouri Star Quilt Company yesterday. 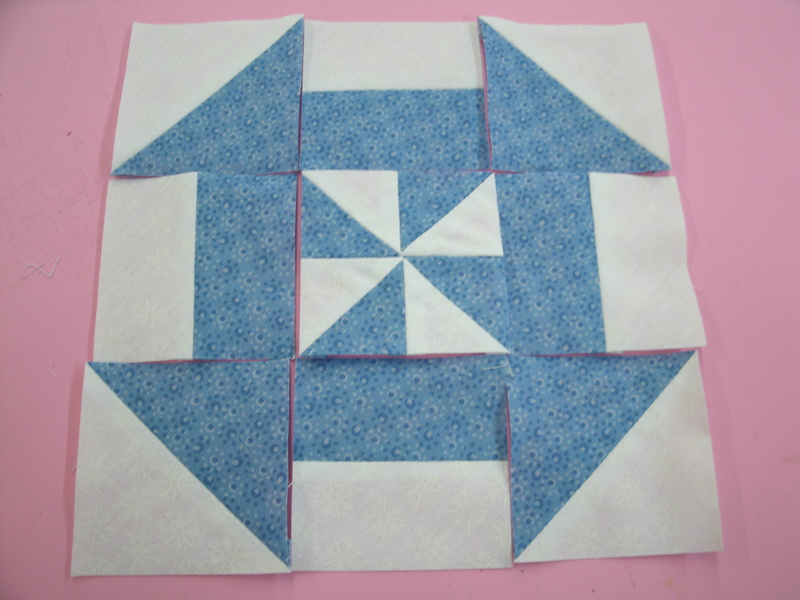 Jenny Doan demonstrates her “Disappearing Pinwheel” block. I love a good trick, so I had to try it…and then I had to start playing with it. First, watch the video and then we’ll play. 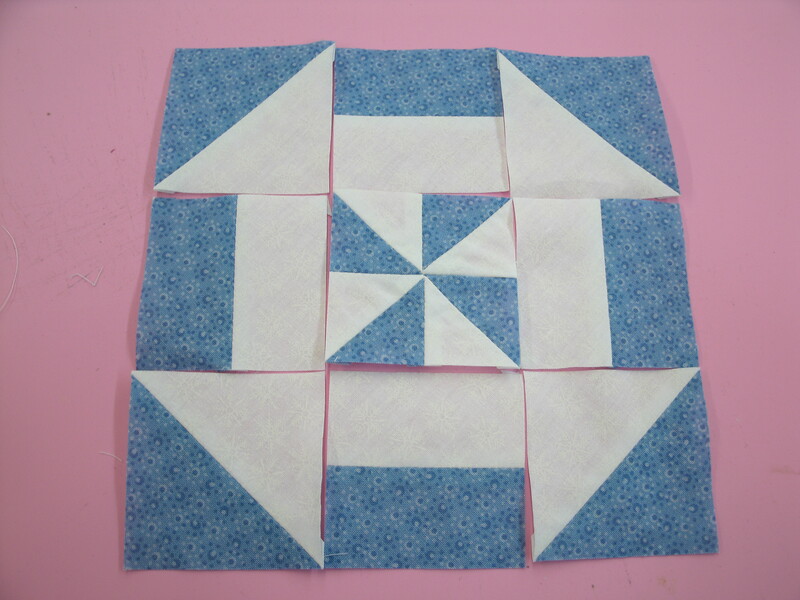 Here is the “official” Disappearing Pinwheel block laid out for sewing. Look what happens if I flip the corner units. And rotate the corners again. 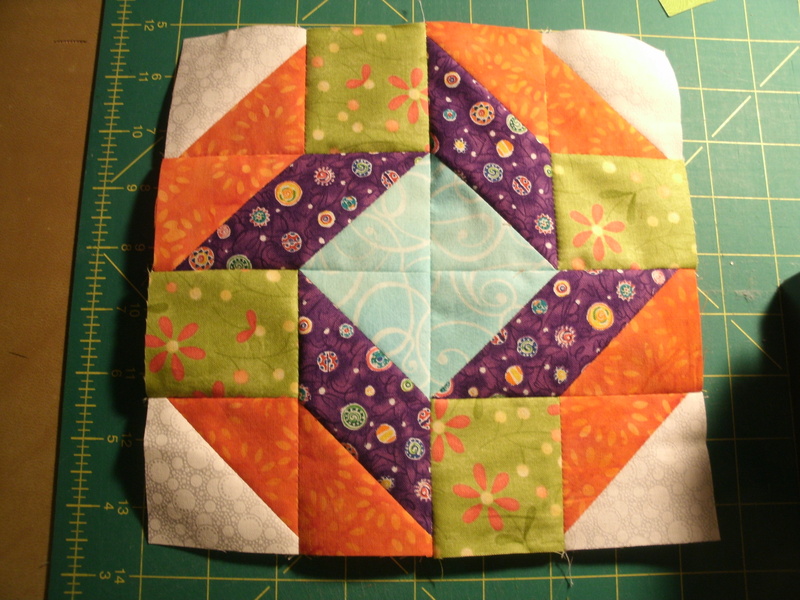 Then swapped the center pinwheels. (above) and did the same rotations (below). My point? Don’t be shy about playing with your blocks. We’re bracing for another winter storm on Montana’s Hi-Line today. Looks like an Alberta Clipper, a fast-moving cold front, is headed our direction. The wind is shifting from the southwest to the northwest and the temperature has dropped from 46 degrees (f) to 29 already. By tomorrow night, we should be below zero. I keep reminding myself it’s going to be much colder and snowier farther east. 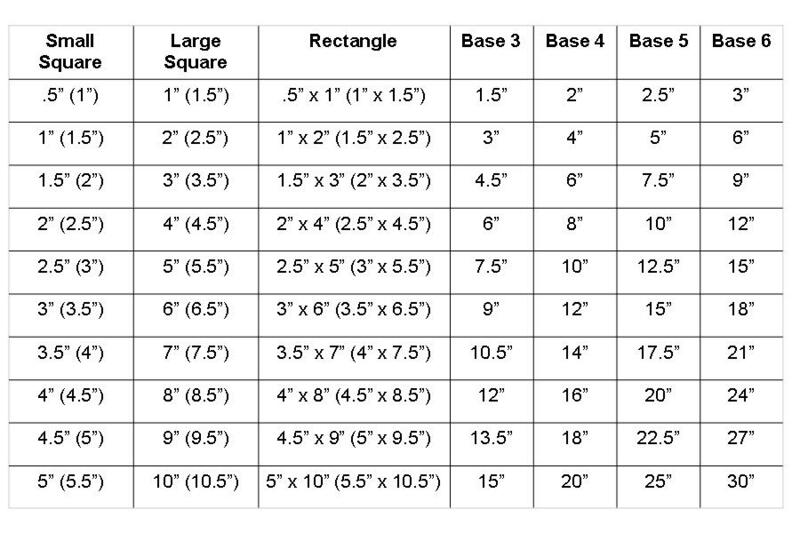 To make an 8″ finished block, all of your squares will be 2.5″, and your rectangles are cut 2.5″ x 4.5″. 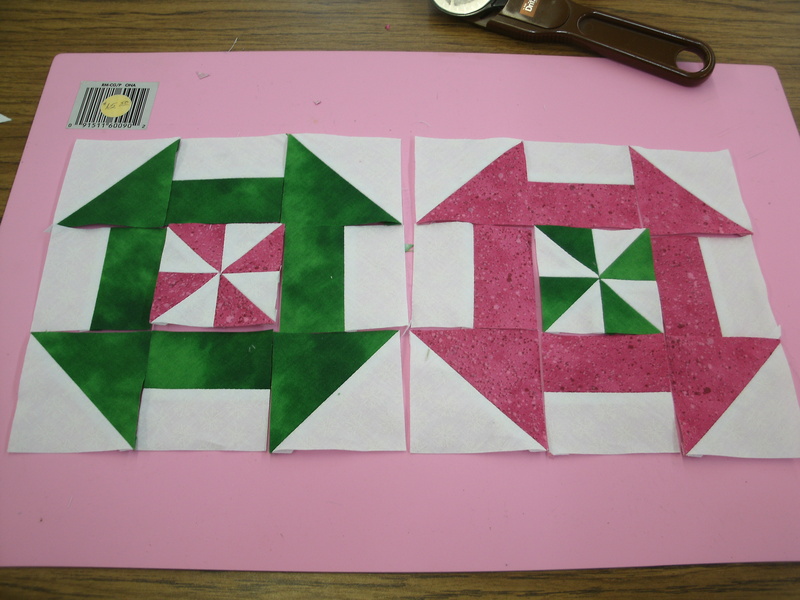 For a 12″ finished block, use 3.5″ squares and 3.5″ x 6.5″ rectangles. 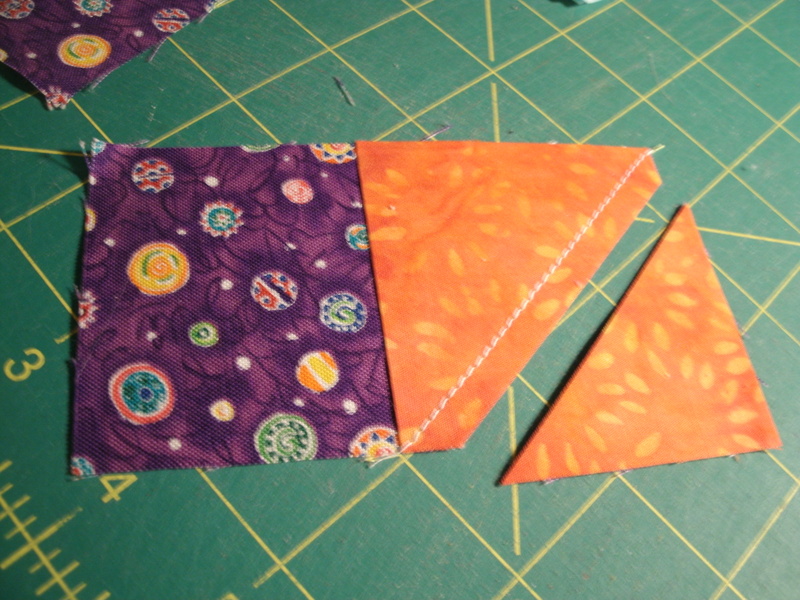 Step 1: use the four background (white) squares and four of the medium (orange) squares to make four half-square triangles (HSTs). 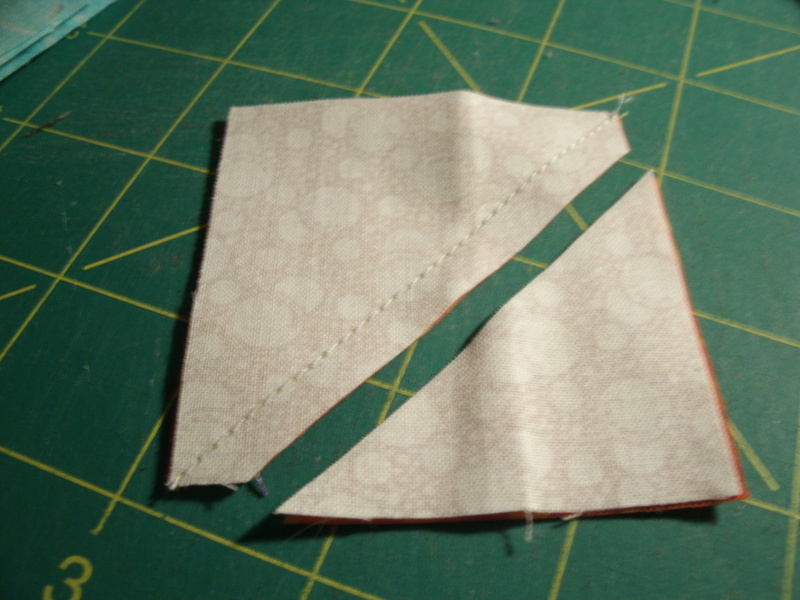 Draw a diagonal line on the back of the lighter squares and sew on that line, then trim 1/4″ to one side of that seam. 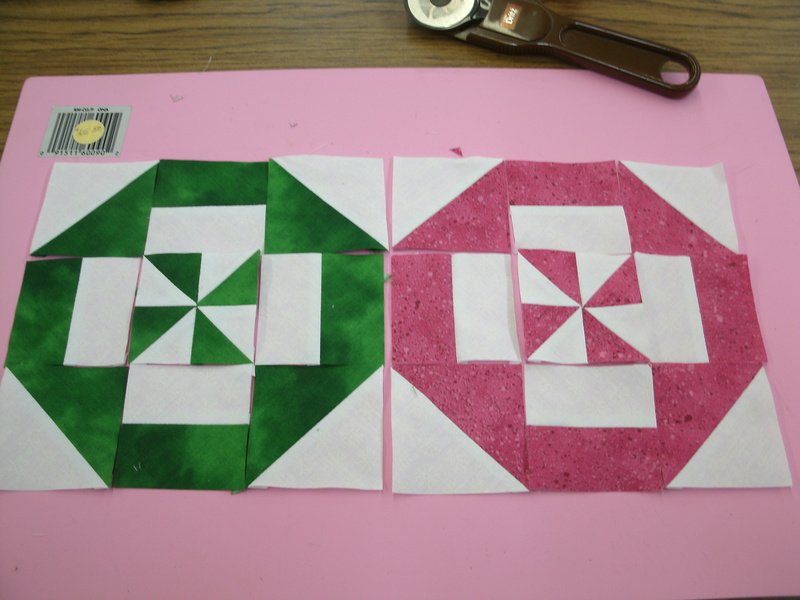 Step 2: Sew the HSTs to the medium-light (green) squares. Be sure that they look just like the photo, with the darker triangle on the lower left and the background triangle on the upper right. Set these four units aside. 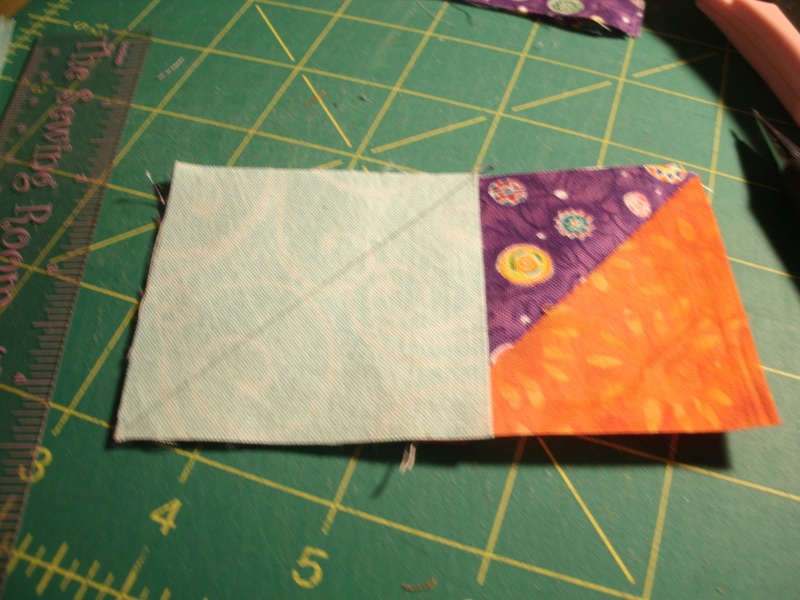 Step 3, use the same technique to put a medium (orange) corner on the lower right of your dark (purple) rectangles. 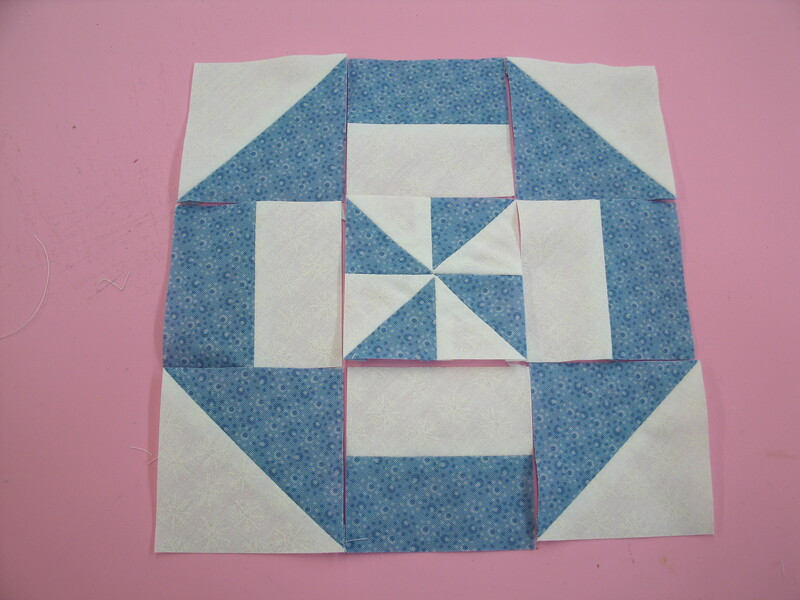 Step 4: Now add the light (blue) corners to the upper left of your rectangles. 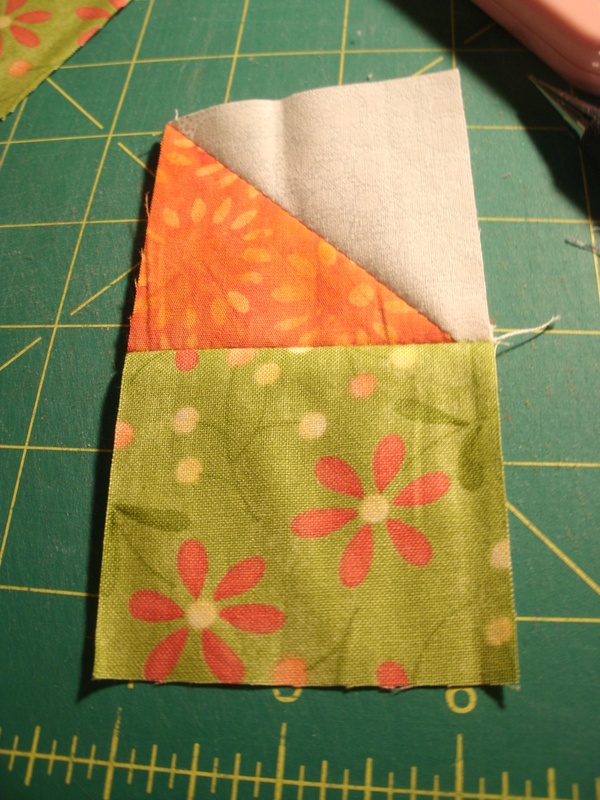 Step 5: Now you can sew the two units into a quarter-section. Make four of these. 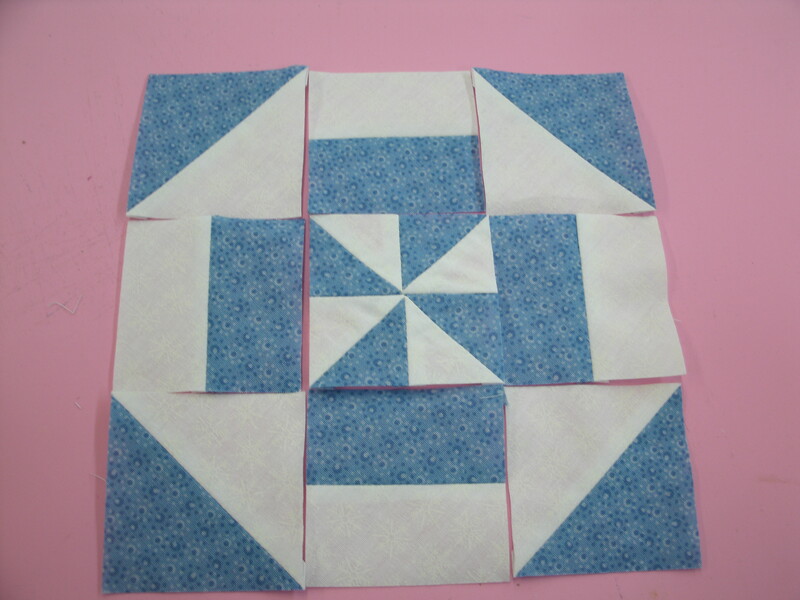 Step 6: Sew the four quarter-sections together with the light (blue) corners in the center to complete your Alberta Clipper block. 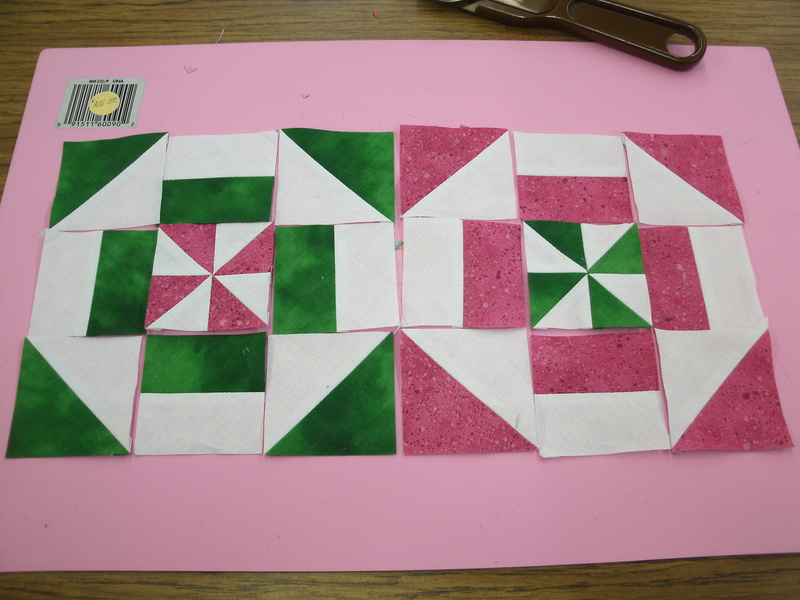 I don’t happen to have a copy of the Base 4 Sampler photo from the book, but I also used the Alberta Clipper (center top) in this workshop sampler that mixes Base 3, Base 4 and Base 6 blocks.